Going into this book I thought it was going to be a paranormal, and I was pleasantly surprised when it turned out to be science fiction. I've never read anything like Every Other Day before. Jennifer Lynn Barnes put an interesting spin onto a creature that's been a little overdone recently in YA fiction, and the originality in Every Other Day was a nice treat. The world was an alternate version of our world. Instead of Darwin discovering only evolution on his journey, he discovered preternatural creatures -- the scientific equivalent of the paranormal creatures in different mythologies. The main character, Kali, is half-human, half-preternatural. She's spunky, daring, and adventurous, and I really enjoyed reading from her point of view. Also, since her father is a University professor of preternatural science, she was able to give good explanations to the reader about the science of the world she lived in. I also really loved the two secondary characters, Skylar and Bethany. Both of them were likable in their own ways. I wish the love story had a little bit more to it, but even so, I still found the book enjoyable. I don't want to give anything away, but there are things that happened in the ending that took me by surprise. 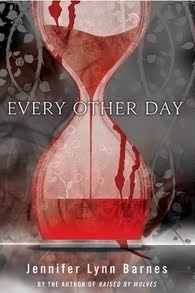 Every Other Day is not a predictable book, and it was nice to not know what was coming. (Even though some things that happened were really sad). I loved reading it, and highly recommend it! Nice review, Michelle! I was just looking for a good book with unpredictable twists. I'll def. look into this one!